Made in the 9th century in the region of Liege, the psalter was brought later to England. Possibly during the reign of King Athelstan (924-939) a series of pictures, a calendar and other material were added to it. According to tradition, Athelstan owned it and gave it to the Old Minster at Winchester, although nothing in the manuscript positively supports this tradition. Athelstan's involvement with the courts of northern Europe, however, laid part of the foundations for the reform of monasteries which led to, among other things, a stepped-up production of manuscripts and manuscript decoration. The psalter's pictures foretell developments in later Anglo-Saxon art. 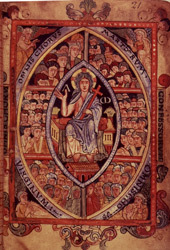 One of two pictures of Christ enthroned among the choirs of heaven, this is the more elaborate of the two added to the psalter in the 10th century. It shows the Christ seated on the heavenly Jerusalem and holding a cross, with the wound in his side and the Alpha and Omega at his shoulders. He is borne in a mandorla, the pointed shape which indicates a 'view into heaven' and often implies vision of the Second Coming. The ranks of the choirs of martyrs, confessors, and virgins, identified by labels, surround him. In its presentation of the subject and its style, the picture resembles Continental paintings, although the theme existed in earlier British and Irish manuscript art and in litanies and prayers. The monumentality of the design makes it difficult to envision the psalter's small size: it would have been an impressive personal prayerbook.